Imagine an artist painting a winter scene. She depicts a white, frozen ground and evergreens draped in snow. Her hand brings the day to a close as she paints night falling on the canvas. In the deep shadows of dusk, she has painted a grim, log cabin, barely visible to the casual observer. Then she dips her brush in yellow paint and, with a few quick strokes, places a brightly burning lamp in one of the cabin’s windows. Warm rays dance on white snow, now made brighter by the light. The lonely lamp wholly changes the tone of the picture, replacing feelings of dark and gloom with warmth and security. Edith Wharton has said that there are two ways of spreading the light: to be the candle or the mirror that reflects it. Sometimes we are candles. We shed light of love and hope. We shine encouragement into dark souls. Or we illuminate with insight. But sometimes we reflect the light. We are mirrors to enable others to see the light of their own goodness and beauty. And when we have no other light of our own, we are mirrors which reflect a greater Light. For some, the world can be bleak and cold. They feel frightened, lonely and even hopeless. 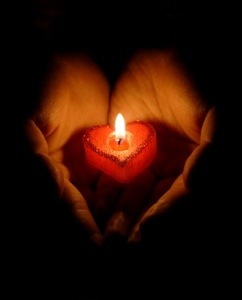 But it’s true that no amount of darkness can extinguish the light of one, small candle.